Little kids and water–the perfect summer combo right? 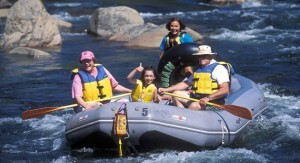 But there are minimum ages for whitewater rafting trips. What’s a tiny rafter to do? If you’re just knee-high to a grasshopper and kindergarten is your reality, not a distant memory, you’re not certainly headed to the Middle Fork, and even the South Fork’s class III rapids are out of reach. Enter the Tom Sawyer Float Trip to save the summer! Running through the Coloma-Lotus Valley, this gentle introduction to rafting was developed for families with young kids–our minimum age guideline is 5 years old. This part of the South Fork is in between the Class III whitewater runs of the upper “Chili Bar” and the lower “Gorge” sections of the river. As it meanders through the valley, the river has only gentle Class II rapids. Splashy riffles give the wee ones a taste of excitement, and there are long stretches of lazy water . . . time for water fights, blackberry picking, joke-telling and paddling inflatable kayaks for the more adventurous among you. Lunch is served at our River Center under tall shady oaks, and all the cooking and clean-up is taken care of by our river guides–no work for mom and dad!